Almost overnight, the leaves turn orange and brown, the air becomes frosty in the harvest moonlight. Is that the wind through the eaves or the old chimney? I know, it is probably just a lonely night owl...maybe. Did you hear what sounds like odd footsteps, or is it the floorboards expanding and contracting in the change of weather? Here as we are celebrating the ending of the second year of F/WFH, this is the time of the old druid end of the year, and therefore it is an association in tandem to compare this with November the 1st and how it soon became All Saints Day. Later Christianized by the auspices of the church into 'All Saints Even', the holiday of the dead, known in Ireland as Samhain, influenced later culture so heavily as to bridge the continents with their arcane beliefs. Running the gamut from black cats, turnip or gourd 'jack-o-lanterns', the predecessor of our carved pumpkins, to our trick or treat celebrations. At one time, the last custom was celebrated more by the adults of a community than by the children. 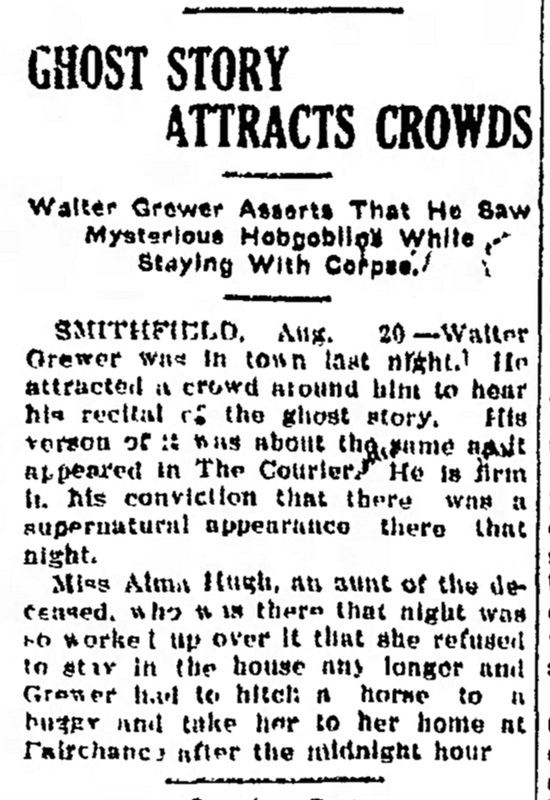 Without further ado, we will be marking mysterious and vintage reports of the supernatural in various creepy forms. Are these things real, or were they mistaken as factual? Do these events still take place? Am I to be the supreme arbiter between modernism and ancient beliefs? Hardly. I will only state what should be obvious: the proposed phenomena of paranormal experiences, those that delve deep into theoretical quantum physics dramatically speculating on the subject of higher dimensions with superstring theories, the theological implications of investigations into spiritual realities, may or may not hold water. Yet there are hints of stray evidence that such aspects of reality co-exist in our world. The polls show our feelings about the supernatural, UFO's, angels, astrology, etc. The acceptance of such depends on your point of view and what you make of it all. This material certainly is interesting in the extreme, that much we do know. Think what you wish, folks. Whatever the significance of innumerable reams of old, and not so old, stories claimed as true by so many people not too different than you and I, it surely cannot hurt in the retelling, and may be beneficial toward keeping an open mind. Do you concur? If not, or, on the other side of the proverbial coin,you are easily frightened, take a small warning against reading any further. After all, this is that special enchanting time in late October when the silken, slippery veils of nature are sometimes momentarily parted to reveal things wonderful and sometimes, ominous. This creepy old holiday, in some circles still considered a holy day, has been known for many years, far and wide, as Halloween. We let our hair down, have some fun and even imitate for a night those spooks and witches. In truth, the telling of macabre mysteries, whether by firelight at a camp out, or around the porch on a stormy evening, is also an integral branch of our history too. The rarity of the scares might well be the fascination of it. Now a days, the lone survivor of the 'burning times' appears to be the fortune tellers and dream books. Back then, the purported pranks of demons and their compatriots was a huge bugaboo of the Middle Ages in which the black arts, which many strongly felt centered in witchcraft and the wicked carnival of dark and malicious mischief of goblins and their ilk, caused the inhabitants to seek after numerous protections, while chasing away the darkness through the unusual customs of their ancestors. 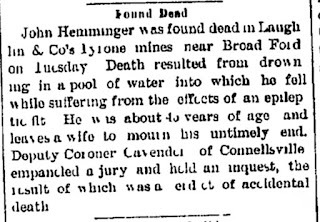 The above article from the Daily Courier is from Feb. 11, 1887. 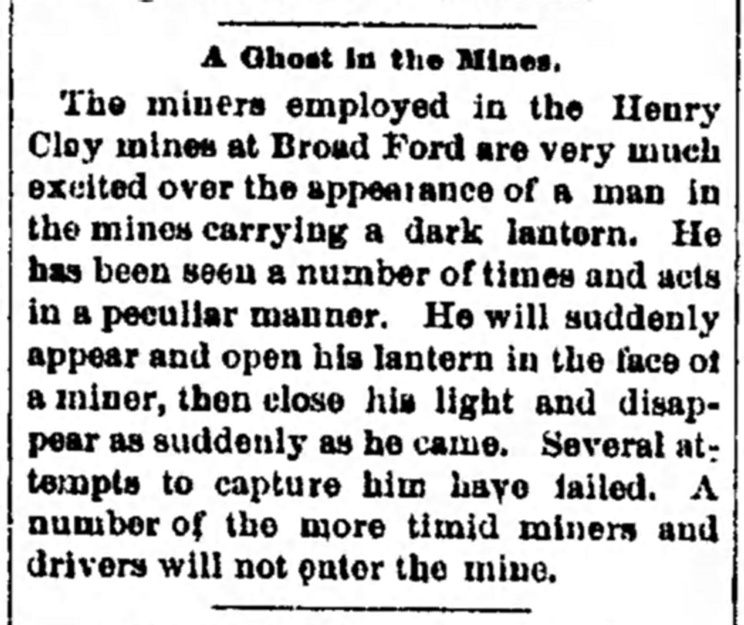 Rumors have traditionally surrounded some of the old mines of the region with tales of knocker's, (diminutive mine spirits) and ghosts of those men tragically killed, sometimes victims of 'white damp', smoke inhalation, sudden flames and explosions. 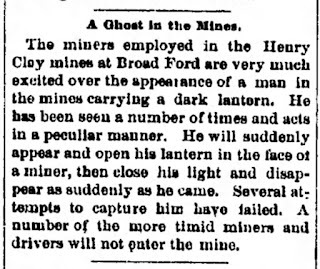 This superstitious belief tended to be particularly prominent for the tragic Hill Farm Mine locality of Dunbar, near Pechin Road, once said to of been a home to Indians with its own burial grounds; likewise, the Tyrone Mines in Broadford at Connellsville. An example of such an unfortunate event that tool place all too frequently is given below. Both mines had experienced local whisperings of this type to the point of affecting the operations wholesale. 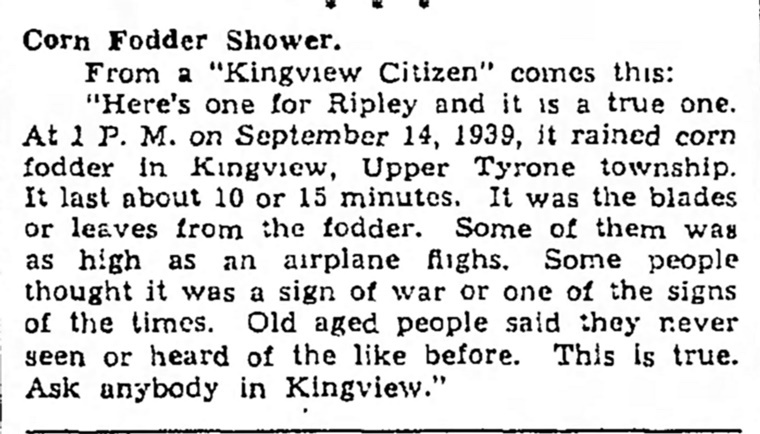 We won't go into too much detail here, as this information was once more widely known. 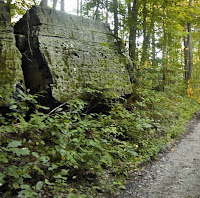 The same might be stated for the closely associated stories of ghosts and bigfoot of the Dunbar Mountains centering around the Irishtown Road and local legends of the Ghost Rock. The subject was covered last season by the television show, 'Finding Bigfoot'. 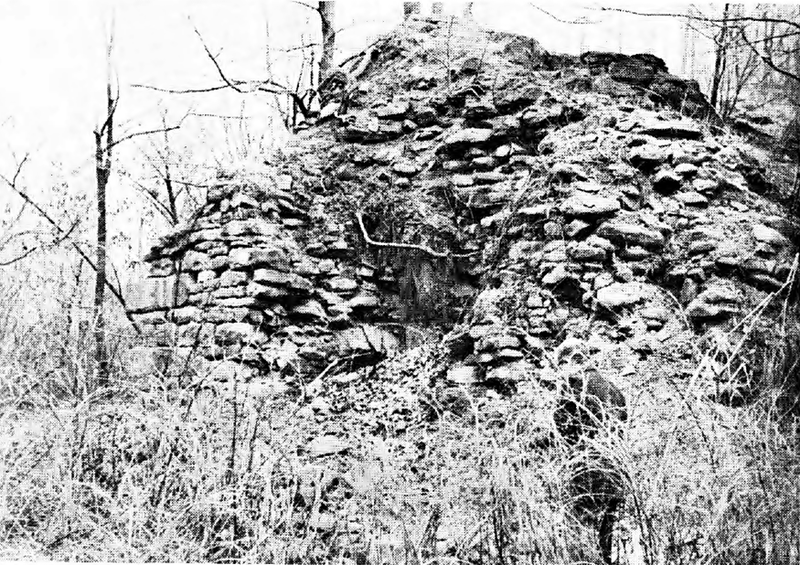 Reputedly, the Etna Furnace near the White Rock Distillery was the scene of Connellsville's first murder. 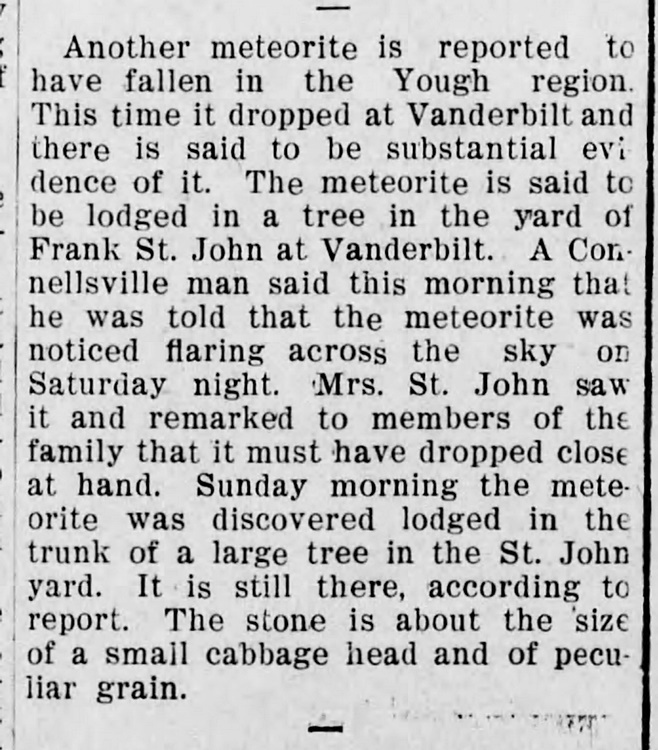 Initially, I noticed an observation of its reporting from the year 1904. 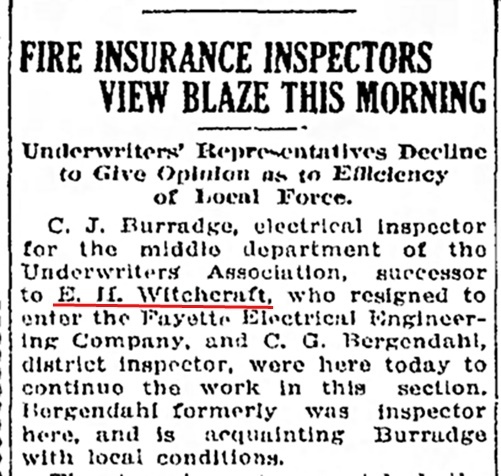 It is likely the events described are from the 1890's, as this was when the distillery was erected near to the Yough Brewery Company's establishment on S. Arch Street. It was originally called the Gemas Distillery, after the first owner, Mark Gemas. In 1898 it was sold to W. C. Reynolds, and in 1904, it was moved to the old Zachariah Connell homestead on the corner of Arch and Fairview. This involved one Wayne Denny, who lived up on the Chestnut Ridge. When he flashed his recent inheritance of gold coins at a nearby tavern, the next morning his broken and bruised body was discovered at the furnace devoid of his precious fortune. The murderers were never found. This was claimed to be a major cause of the haunting of the area where in olden times the vicinity was rife with the talk of scary happenings. Apparently, this was just the start of it all. According to an old historian Frank Pierce, "hogs and cattle seemed to very mysteriously die, their destruction being charged to witchcraft. Great heaps of wood were fixed as if preparing to offer a sacrifice to the gods. 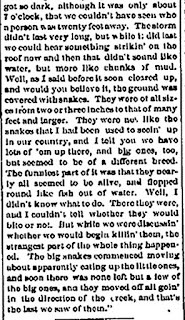 On these the dead and strangely sick animals were burned. 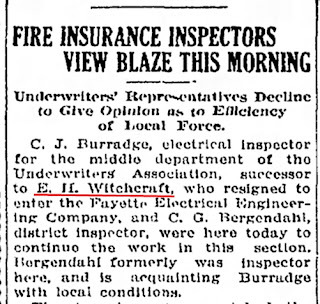 As the burning progressed, the witch was expected to appear on the scene and sue for peace; for it was claimed by the witch doctor that the burning of the carcasses would also torment and even singe the witch". Strange stuff indeed. One thing is definite, it isn't Yours Truly making any of the material up you're reading here! Local talk had circulated quite a few years ago of Iron Bridge being haunted. I, for one, always lent a willing ear to such discussions, however brief. While this is one of many speculative traditions, there are some interesting stories covered on my article HERE which will give you pause as to a few reasons why this claim was made! I do possess other ghost tales from areas much further afield which, for various reasons, mainly concerning the length of this post, I hesitate to go into in any depth here and now. 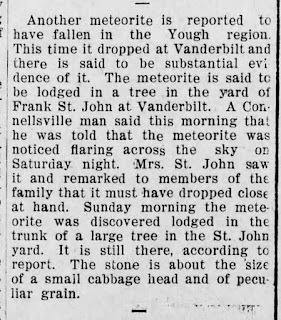 To wind things up to an even scarier note, there were old weird things told of Hill Grove Cemetery in Connellsville back in the day, as well as a strange story from Scottdale. 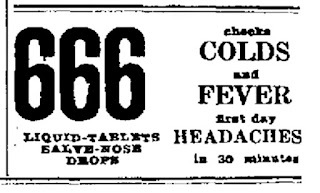 The first you may not recall, as this was related 125 years ago. 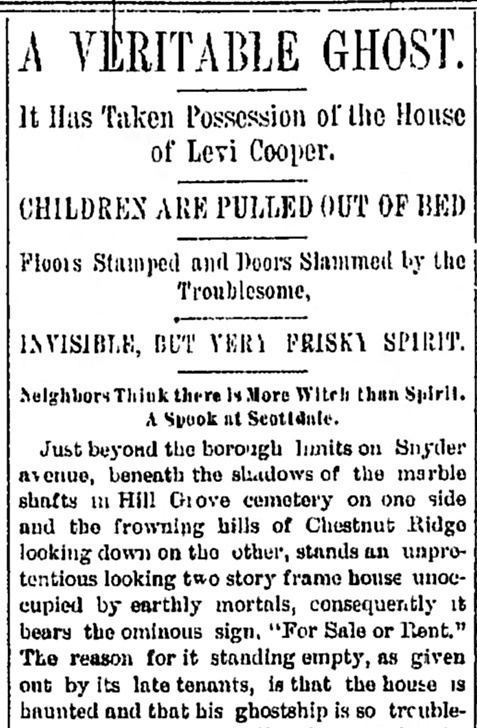 Very briefly, the Daily Courier article of October, 1890 goes on to state many later residents felt, since various people died in the old house, that it was allegedly quite haunted. It received nocturnal visits by spirits, in fact, one gentleman, John Mitts, was quoted as saying, "there was something radically wrong with the house." Another dweller said, "the noises heard were wild, weird, and blood-curdling." Ceaseless trampling of feet, an appearance of a dark figure, and children pulled from their beds were the kind of things beyond bumps in the night occurring there over the years. Some said the place was bewitched! 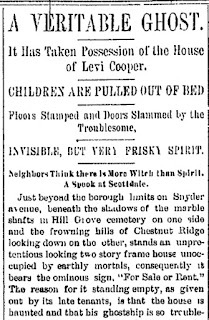 Ghostly tales were afoot in the Fallen Timbers area of New Geneva and New Haven concerning a series of 1883 articles for the Keystone Courier by A. W. Scott, with accounts going as far back as 1814 with stories of Indians and pioneers to boot. 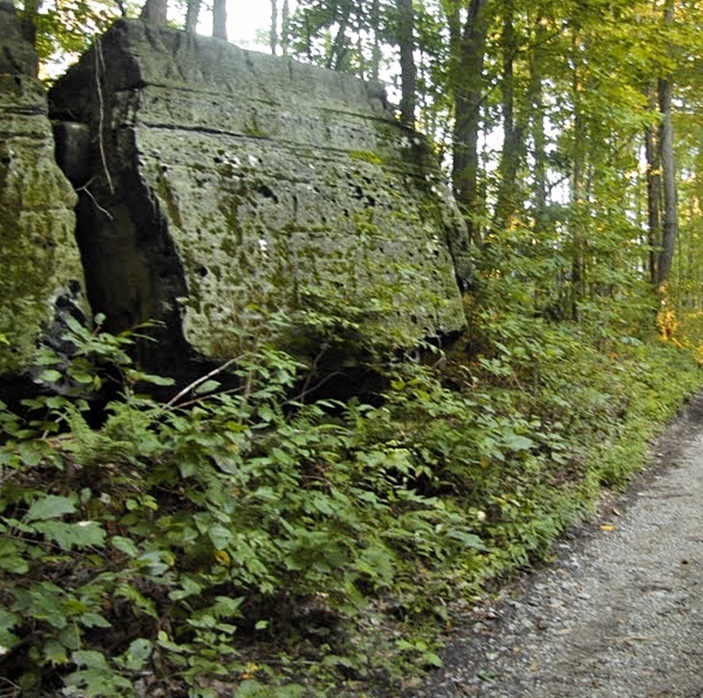 We have a seemingly formidable old legend centering around the Alliance Furnace, west of Dawson, yet on the borders of Fayette and Westmoreland counties at Jacobs Creek in Lower Tyrone township. This is told of Peter Marmie who once owned the place. Historically, the iron furnace began in 1789. Earlier, in 1780, the Pittsburgh firm of Turnbull, Marme and Company patented the 'Roxbury Tract' of thirty acres at this lonesome spot. It has been said the first bar of iron west of the Allegheny Mountains was made here, and the celebrated Indian fighter, General 'Mad' Anthony Wayne gained his shell and shot here for some of his campaigns. The furnace was little used after 1793 and by 1804 was out of blast for good. Supposedly, when his prospects headed downhill financially he went stark raving mad, ending his last days jumping into the furnace in blast after sending in his prized dogs! Grisly you say? Well, the legend goes that every year on the fateful day at midnight, he can be seen blowing his horn while his ghostly dogs are said to howl at passersby. This is how the old story goes, anyway. Well, it gets better, but just for the telling, not the facts. 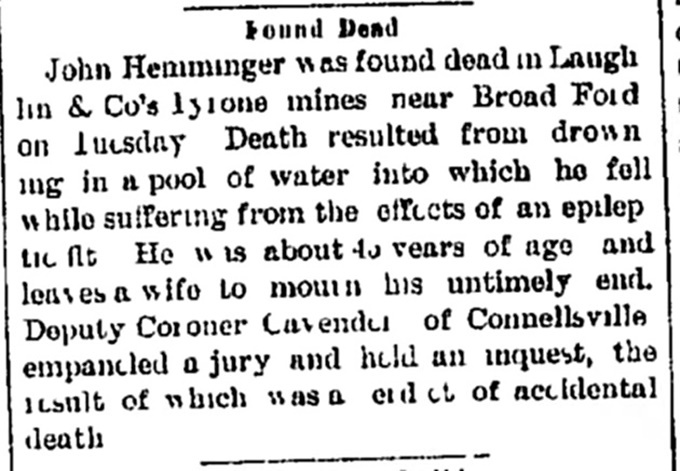 Sorry to say, the Holker aPapers prove this was Marnie was still alive after the events recounted. Could this be some mix up of another person, or another furnace? Shades of Odin. Who knows where the mythical spoof originated from. Nearing our last story, but by far, not the least by any stretch of the imagination, is one of a more intimate and recent nature. There are witnesses claiming stoutly the actuality of certain eerie happenings that took place in mid-1970's, (and some who only hesitantly will broach the detailed subject). It is what it is. A truly strange tale. Those who experience the horror have recounted the facts and I am a party to some of the details. The names are not given, naturally enough, as there are those who simply do not approve of the experience gaining the publicity of a large audience with their names attached to such a thing, and I know this is the case with the next tale. An unpopular reality is retelling this kind of thing to those who probably would not believe it, and who could really blame them? Be forewarned, this one is a real hair raising doozie! On a summer night about forty years ago, some young campers decided to get together and spend a night at McClure. You must take the road to the left after the turn from Rt. 119, the next turn from the Scottdale exit and go near a hundred yards and to the right. 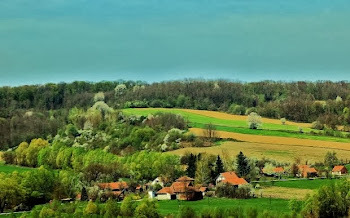 Well, there was just a stand of woods there in those days and now their are only houses. New ones at that. Back then, you could frequent many local areas and no one really cared. They had a few beers, listening for a while to some classic rock music and talked til late, totally unaware of the disturbance soon to influence their young, impressionable lives. They brought along and used up a small amount of the firewood gathered for the occasion when a few of them said they felt a bit chilled and others mumbled something about getting the creeps. Another didn't feel too well. SO, the story goes, they rolled out the sleeping bags on entering the tent and prepared for a good night of relaxation and rest. This was hardly to be the case. Just for the exception of one of the quartet. You see, only one camper knew the reputation of this place, and since he was a local of McClure, soon he said he suddenly decided to go home and sleep in his own bed. The others chastened him to stay, but no sir, he left down the incline of the small hill toward his house and it's one distant glimmer and was gone, altough his part in this tale is not near over. The time was then around 2:00 a. m. and the fellow on the far left side had entered dream land already. That left two who were awake. Soon, almost immediately, a far high pitched sound was heard above the breeze somewhere toward the south. They both commented on it and made statements about how odd it sounded. Was it a woman or a bird? The next thing that happened, maybe a minute later, was a much louder, bolder cry. This time, it came approximately at half the distance and was very unusual to hear, causing serious alarm in their minds. It was distinctly like a cross between a woman and a bird, yet to these guys who well knew the terrain and the animals, trappers, hunters and fisherman, the mystery remained on their ears. As it was clearly neither. "Did you hear that? It is much closer now!" "Yea, I heard it, that is scary. What the hell?" SO they reached for what precious weapons they could locate, a flashlight and a small axe and gripped them tightly deciding when the noise was heard again, to jump out of the tent and confront this unknown menace face to face. What they were not aware of was the fellow that left in a hurry, had heard it all on his way home! He didn't really escape after all. The third manifestation arrived. Their hair stood up, or so they thought. The horrible scream was right over the tent they were hunched down in, while the third boy still slept soundly. They carefully described this as excruciatingly loud and ear piercing, as nothing any of them ever heard, before or since. And would ever hope to hear again. The result of this blast of deafening noise which for a few moments had loomed ominously over them, was the two immediately passed out. Asleep. No reaction, no consciousness; that was all. The very next day, oddly the memory didn't come to them early, but by bits and pieces. One who had laid there listening in the pitch dark and the fellow who ran home had strange feelings, like someone else was in their heads! Just not themselves, you know. They wandered around for a part of the day and soon pain came creeping up on them. Their necks felt wrenched and would tilt from one side to the other. This happened from the evening until around midnight. The fact is, they both had to be driven to the emergency room and were checked out. The last fellow was told by the doctor, this is a funny coincidence, but a teenager was just in hear complaining of the same exact bone crunching symptoms! 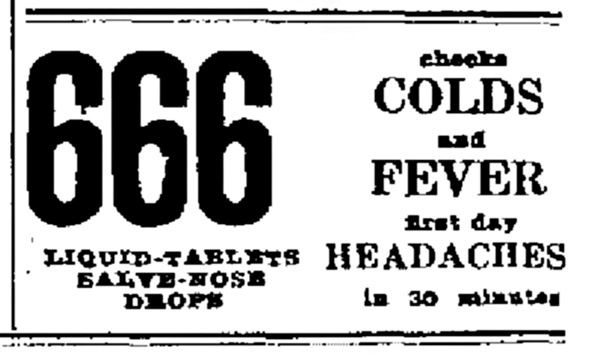 Well, pain relievers and a barbiturate were quickly prescribed and they were sent home as best as could be managed. The parents of the kids verified this account. Nothing else could be done. Slowly, the feeling of being hung, and they even said it felt like rope burns on their necks, the slow turning of their heads, excruciatingly agony, from one side and then to the other, slowly but surely subsided. Gradually the pain became a dull ache and eventually went away. By the next day, by all appearances the fellows had, thankfully returned to a normal state. Yet, they both wore crosses from that night on for years to come out of the sheer terror this caused their psyches. This was a well known fact to their close friends and some school mates. What the local lad knew and hadn't before told, was that a local woman or lass, was always said by natives of McClure, an old Irish community, to of had a terrible break in her loving relationship with another man. Unfortunately, a child may of been the cause. The sad result of the anguish she was consumed with started to cause her to lose her mind and in her grief, she killed her newborn baby and hung herself from one of the nearby trees! So the old tale went along. One wonders, was this the anniversary of her death? No one could seem to recall, or were not willing to recount any more details in the close net village. Was the banshee there to warn, or take some revenge on any male who came there late at night? It is extremely unlikely the truth will ever be related, but that is the final Halloween tale on our blog post. By the way, invariably, the legend of the banshee uneqiouvically states the creature, for mourning, grief, death, or what not, according to traditional folklore, cries loudly three times. The story is what it is. 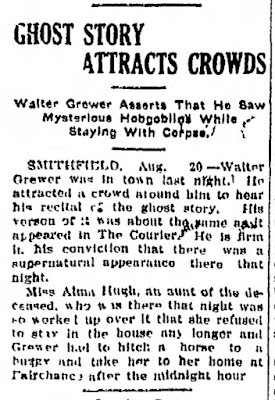 Without a bit of Forteana, (this phrase can be looked up), our supernatural tour might not be complete. 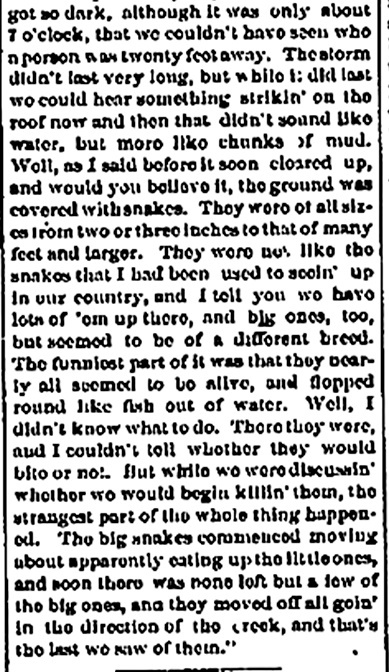 Here's an enjoyable one of a rain of reptiles taken from the annals of the Connellsville Daily Courier way back on June 26, 1885. This was is not in the best condition, but I touched it up as best I could. Hopefully when clicked on, it can be read without squinting too much. You do have to see this for yourselves! I seriously doubt anyone old enough to remember is still around. There are a few more ghost stories from locals that could be related, one is even of a bigfoot. As most of these are purely second hand, it is to be admitted these type of homegrown stories would be considered that much more questionable. Being that this may be enough for most of you, I will kindly stop here. Here's hoping you found entertainment in this hodgepodge of oddities and ghost stories in this neck of the Pennsylvania woods! 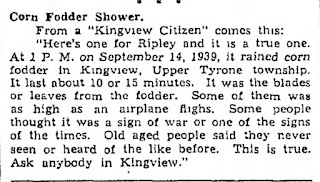 On a personal note, I certainly relished searching for these accounts, and presenting them here, on Histbuffer's, Fayette/Westmoreland Forgotten History for the thrill and unusual quality of this post. Do you know what I'm thinking, if you do, you're psychic!, How about YOU sending in some of your spookiest experiences or stories? Do you think you can beat these? I would love hear about them! Good one!!!! I"ll definitely keep my eyes open this winter when i'm out on those cold dark nights plowing snow!!! Keep up the good work. Glad you enjoyed the vintage stuff. You do that, and do be careful out there, even though sometimes the living are a lot more to worry about-lol! Let me know if you've gotten anywhere with the metal detector on the old BR, alright? Take care and thanks for commenting!